I am trying to understand the concept 'Time-varying aggregate risk premium'. 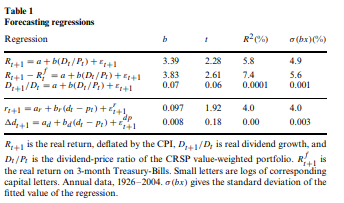 "However, rational asset pricing theory posits that stock return predictability can result from exposure to time-varying aggregate risk, and to the extent that successful forecasting models consistently capture this time-varying aggregate risk premium, they will remain successful over time". What is time-varying risk premium and why is it important in forecasting models? Another way of staying "time-varying risk-premium", is saying that the risk-premium is predictable. However, that the fact that the risk-premium is predictable does not means that you can make money out of this. The dividend-price ratio predicts the equity premium. When D/P is high the returns are high. The second reference (Goyal), shows that equity premium is predictable in-sample but not out-of-sample. So you cannot trade on this predictability - which basically implies that you cannot forecast the ex-post return. Ex-ante we know that equity premium moves with some state variables in the economy (i.e. expected returns are high in recessions) but in practice this cannot be exploited economically. Does this mean markets are “inefficient”? Is this an invitation to “buy low and sell high?” Not necessarily. Time varying risk premia are possible. Think like an economist, and think about market equilibrium, not trading opportunities. Prices must adjust to eliminate trading opportunities. People don’t buy stocks because they’re scared. Why at some times are they more scared than others? Up until the work of Robert Shiller in about 1980, it was thought that the expected excess return on the market $(R_M−R_f)$ is constant and is an equilibrium risk premium. Shiller showed that this is not correct, so the next hypothesis was that the e.e.r. is not constant but changes with the state of the economy (though it remains >0 at all times). This is called the time-varying risk premium hypothesis. For example in the middle of a serious recession the risk premium is thought to be larger than usual, according to John Cochrane among others. This new idea has changed the interpretation of the Efficient Market Hypothesis considerably. Under the "constant expected return" idea the EMH was interpreted as saying that aggregate stock prices are unforecastable. Under the "time varying expected return" idea this had to be revised to say that the market return could to some extent be forecast, but only due to the state of the economy, not to any insight into the future behavior of stocks. So the EMH was weakened considerably (IMHO). This partial foecastability continues to exist even if "everyone knows" the forecasting model, since it is due to macroeconomic factors not to superior private insight. Not the answer you're looking for? Browse other questions tagged risk finance econometrics quantitative prediction or ask your own question.